Another month means another book and this one I could not put down! I was reading it in the bath, in bed late at night and early morning...I was hooked! When Heidi got in touch and asked if I would give her book a read i read the synopsis and thought hmmm this isn't the kind of book I would usually pick up but let's try it and boy am I glad I did. 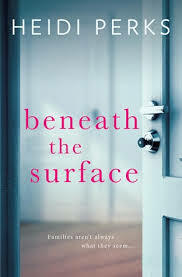 Beneath The Surface is a roller coaster ride through a crazy time always having you guessing about what is going to happen next but often being even more surprised with the reveal. The twists are well written and realistic. The book is told from the prospective of 3 people which keeps the story interesting and twists and turns the tales from all directions making you feel like you get a more rounded view of what is going on. Abi is just a teenager and she comes home from school to find her mother and twin baby sisters have vanished. Leaving her alone in the world and left to spiral into a crazy world of partying. Years later through going to therapy her counsellor suggests she writes to her husband and we follow her journey as she attempts to track them down. The characters are well written and the differing ages of the three main ones make the book so relateable to women of all ages. You feel like you follow Abi's torment and hope she can just find the family she lost but you also get to hear what is going on in their lives as they get closer and closer to meeting. Without spoilers the book covers so many important issues like mental health and will make you envy the connection twins can have. I literally gasped out loud so many times and even shed a few tears such a well written heartfelt book that you must read. You can buy the book by clicking the book below as it released this week! This sounds so interesting, I've read a few books where people vanish but this one sounds a little different. Sounds like a good book to read. I must start reading some books again. Wow, what a thing to come home from school to. This sounds like a really interesting story. This is so my kind of book. I absolutely love books with good twists and turns. This sounds like a really interesting book, I've added it to my kindle list as it sounds right up my street. I love a book that you can not put down, thanks will add this to my Goodreads list.